Rev. Carolyn Winfrey Gillette, co-pastor of Overbrook Presbyterian Church, in the sanctuary where many of her hymns inspired by current events are sung. Within hours of the news that a gunman had killed 26 people in a Texas church, the Rev. Carolyn Winfrey Gillette began what has become a sad ritual. "A hymn," she said, "can connect the faith of thousands of years with what's happening today." Her "O God, We've Prayed in Wind and Rain" is about the tragic aftermath of Hurricane Harvey in Texas and Louisiana and the flooding in Nepal, India, and Bangladesh. "To a Place of Celebration" is a plaintive response to the mass shooting at Pulse nightclub in Orlando. "O God, Our Words Cannot Express" was written on 9/11, and later sung in a video by Noel Paul Stookey of the folk trio Peter, Paul and Mary. In September, students at St. Joseph's University presented Gillette's "Young Joseph, the Dream," which uses a Bible story to address the plight of young immigrants known as Dreamers, illegally brought to the U.S. as children. "I was so moved when I read it, I thought, We can't not sing this song," said Tinamarie Stolz, campus minister at St. Joseph's. For Gillette, 56, inspiration comes not only from the news, but from conversations surrounding it, from friends, congregants and strangers asking such questions as, "How could God let this happen?" 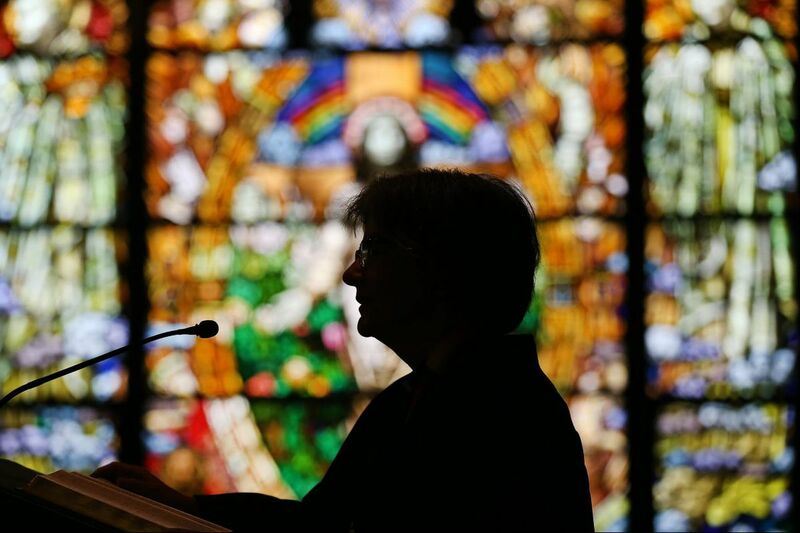 Bishop Peggy Johnson of the Eastern Pennsylvania Conference of the United Methodist Church commissioned a hymn from her about Peter's denial of Jesus. Gillette's topicality and plain-spoken language, she said, are refreshingly far-removed from "that old stained-glass way of talking." "We love our old hymns," Johnson said, "but they don't necessarily speak to modern social justice issues." Gillette began writing lyrics in the late 1990s, while daydreaming in a synod seminar. The class on the Psalms strayed off topic to a discussion of scripture set to music. During the session, she crafted her own verses to a song about the Ten Commandments, which she titled "Gifts of Love." When her husband and co-pastor, the Rev. Bruce Gillette, posted the song on the internet, a clergy friend at Cape May Presbyterian Church asked to use it during Bible school. Seeing the children perform it, she said, "inspired me to keep on writing." She seizes the moment to compose, whether on the train, in a car, even in a paddle boat on vacation. Her husband, 59, shares her lyrics with her fans mostly via her website and social media accounts. The couple met in the library while studying at Princeton Theological Seminary. "I came to the rescue at a copy machine," he said. After helping her with a stubborn paper jam, he used the ministerial-student pick-up line: "Would you like to join me for evening chapel?" Carolyn Gillette recalled being a little girl, maybe 3 years old, standing on the pew at her family church in Smithsburg, Md., singing hymns flanked by her father, David Winfrey, a seminary graduate who became an English professor, and her mother, Jane, a homemaker with a flair for poetry. "The hymn book could have been upside down for all I knew," she said, "but I just remember the feeling of being surrounded by the music of the church and feeling happy." Gillette went on to earn a bachelor's degree in religion from Lebanon Valley College in 1982 and her master of divinity degree in 1985. Gillette's first current-events hymn was "The Storm Came to Honduras," about the destruction left by Hurricane Mitch, which killed more than 7,000 in Central America and the Caribbean in 1998. Since then, she has written two books of hymns and her work has appeared in scores of magazines and on websites. When the subject is controversial, people who have asked to use her songs sometimes leave out a verse for fear of provoking debate. In "To a Place of Celebration," about gun violence, the third verse urges leaders to take action and people to "work for legislation that will curb guns' awful toll." In one church where it was sung, that verse was omitted. Gillette's lyrics reflect her belief that words often aren't enough — a theme that emerged so strongly while contemplating the Texas tragedy that it became the hymn's title, "If We Just Talk of Thoughts and Prayers." The music had come from an English melody, "O Waly Waly," from the early 1700s. "Writing hymns helps people to make the connection between their faith, their life and taking action," she said. "We often say that our thoughts and prayers are with you. But we don't follow through. If a hymn inspires us to call our Congress people, or donate to a cause that makes things better, then that's a good thing."